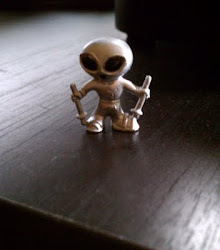 High Strangeness: Happy Anniversary, Roswell! 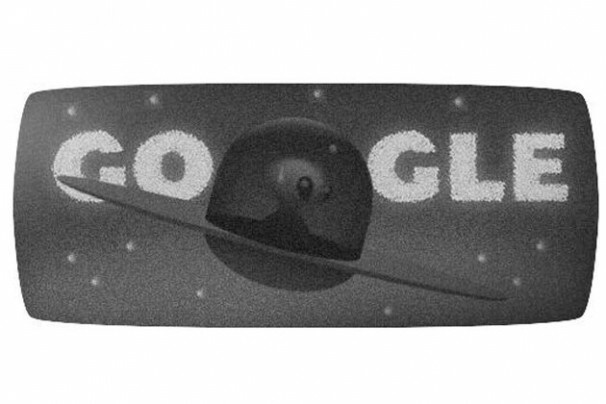 I just spent waaay too long playing the cute little Roswell flying saucer game on Google's homepage (and only solved the puzzle with the help of my son Cxxxxx), but I'm glad I did it, because it's a nice way to commemorate the 66th Anniversary of the famous "Roswell Incident." Whether you believe the story or not, you can't deny the power of the Roswell story--for better or worse, it's become an enduring American myth. He's so cute! You can't not help the lost alien! Here's a quick recap: On July 8, 1947, a guy named Mac Brazel, foreman of a ranch near Roswell, New Mexico, found a pile of what seemed to be wreckage from an aerial crash out in the middle of nowhere on the ranch. The wreckage made its way to Roswell Army Air Field (RAAF) and into the hands of an officer named Jesse Marcel, who announced to the press that RAAF had captured a downed flying saucer. When the Army brass found out about Marcel's news release, they freaked out and quickly changed the story. Reporters were told that the initial report had been a mistake; the wreckage was actually from a crashed weather balloon. The crash site on the ranch was quickly cleaned up, both Brazel and Marcel were muzzled, and the story died a quiet death. 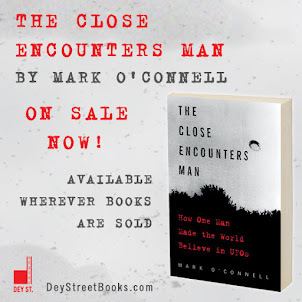 Since it was rediscovered in the 1970s the story has taken on mythic proportions, but people are still arguing over what really happened: Was it the news story of the century? Was it the clumsiest government cover-up in history? Was it a crashed flying saucer, or just a weather balloon? If you want to know more about it, there are lots of places you can go; here's one website that seems to be quite popular. Although I don't believe that either side has definitively proven its case, I remain open-minded. And in the meantime, I enjoy the many cultural treasures that have come about because of that "Wrong-Way Corrigan" of the alien world who took a wrong turn at Alpha Centauri in 1947 and crashed into the New Mexico desert. One such treasure is today's game on Google. Another is the long-lost stage production of "Roswell, the Musical," which I first found out about a few days back when my daughter visited the fabled city in the desert and brought me back a local UFO magazine announcing the musical--in 1999. I was intrigued that there existed such a thing and I had to find out more... Surely if a stage production about the Roswell Incident exists, it deserves to be put on again for today's audiences, doesn't it? And who better to produce the revival than me?? I did a little digging and located the writer & composer of "Roswell, the Musical." Gxxx was a thoroughly pleasant man. He was delighted that I was interested in learning more about his play, but he informed me that he no longer had a single copy! They play had been put on for three years, from 1999 to 2001, but then there had been a parting of the ways of the original company that produced the show, and the playbooks and scores just disappeared. All that survives is this little photo essay of one of the productions. You can see at a glance that this was a well-mounted show. The cast is huge, the costumes are first rate (as long as you don't look too closely at the aliens' feet), and the Coca Cola Company was a prime sponsor! My son Cxxxxx thinks the whole thing smells like a government coverup, but I disagree. Having spoken to both men, and found them both perfectly nice to talk to, I think it's just a case of creative differences and hurt feelings. I bet if I offered them both a cold Coke and we sat down together to talk it over, we'd have a revival up and running in no time! And now there is a ray of hope... After a few minutes of talking, Txx suddenly remembered that he had raw video footage of the production taken by a Japanese TV crew back in '99, and he just might have a VHS dub... If he does, he may just be willing to lend it to me. And if he does, and if my old VHS deck still works, I could be in for the biggest, bestest celebration of the Roswell Incident ever!